Remove the seeds from the kabocha and cut it in half lengthwise and then in half again crosswise so you have 4 roughly equal sized pieces. Slice into evenly-sized wedges and then sprinkle with sugar and drizzle with soy sauce. Let the kabocha marinate for 2 hours. Place the marinated kabocha in a pan just large enough to hold them in a single layer. Pour the marinade over them along with the dashi. Bring to a simmer over medium heat and then lower the heat as needed to maintain a gentle simmer. Carefully flip the pumpkin pieces over after 7 minutes and continue to cook, gently shaking the pan from time to time to allow the sauce to wash up over the kabocha. 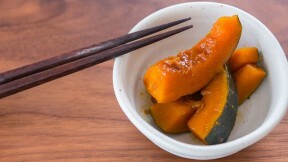 The kabocha is cooked when it is tender and the sauce has reduced to a thick glossy glaze (about 15-20 minutes).